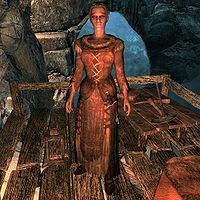 Swanhvir is a Nord miner at Rockwallow Mine in Stonehills, the small mining settlement east of Morthal. She sleeps in the camp near the mine entrance every night between midnight and 6am. Immediately after waking up, she heads into Rockwallow Mine and spends the next twelve hours working, relaxing, or eating. She emerges from the mine at 6pm and spends two hours dining with her fellow miners in the camp. At 8pm she starts working again, this time carrying lumber back and forth between the smelter and Sorli's house for two hours. The rest of the evening is spent strolling around until she climbs into her tent at midnight. She wears a set of farm clothes and a pair of boots. She is equipped with an iron dagger for protection, and carries a key to the non-existent longhouse, as well as a selection of common loot and gold. She seems to have given up on life, saying things like "I'm just here to work the mine. Nothing else matters anymore." or "The outside world means little to us, and we'd like it to stay that way." She may also comment on her work, saying, "When you work hard enough, really get into a rhythm, everything else just fades away." Gestur: "Let's make sure we're just as productive this month as we were last. If Bryling's happy, we're happy." Swanhvir: "Yes sir, of course." Gestur: "All right. Keep up the good work." Swanhvir carries the key to a non-existent longhouse, obviously skipped in favor of the exterior camp. This page was last modified on 20 February 2014, at 07:24.